Throughout June, students of Barnsley College’s Level 1 and 2 Art and Design First Diploma have been exploring four different exhibitions in Barnsley central, each of them reviewing what they saw. I have had the pleasure of picking my favourites. Here are four reviews of Bike Show @ The Civic, Barnsley. Friday 16th May – Saturday 12th July, 10am – 5pm. Free admission. Bike Show is designed to appeal to cycling devotees, amateurs and novices alike. With an emphasis on the influence of cycling culture on contemporary design, the exhibition explores technological advancements and the best in innovation, presenting particularly unusual and pioneering examples of the two-wheeled transportation. 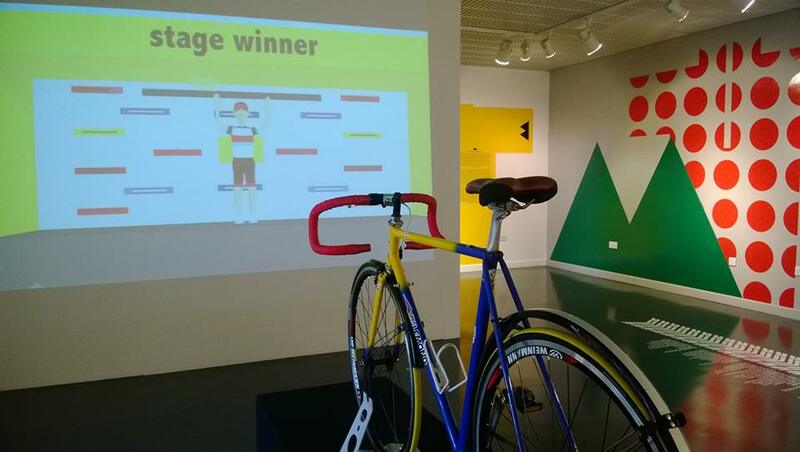 The exhibition examines the spectacle of the Tour de France, its history and language. It also showcases sustainable bicycles, recycled bicycles, bicycles that answer many of the practical and ecological issues in contemporary bicycle culture, and several Yorkshire riders. Notable exhibits include a vintage Tour bicycle ridden by Greg Le Monde and kindly loaned by Barnsley Road Club; frames by Italian bicycle frame builder Dario Pegoretti, including a specially commissioned bike for this exhibition; vintage jerseys and shoes from notable cycling celebrities and the best in contemporary bicycle design from the likes of Ben Wilson, Mark Sanders, Biomega and Philippe Starck. Artisan bicycle making has gathered new converts in recent years, and there are few better to illustrate the slow craft of hand-building a bike frame than Sheffield’s Field Cycles, who are featured in this design-oriented exhibition about modern cycling. There were a few bikes that really stood out to me like a chopper style bike made of wood from Dario Pegoretti, and another bike which looked like a fairly normal racing bike but the tyres were huge compared to the rest of the bike. The bike that really caught my eye was a small blue bike which is really hard to explain but it seemed very flat and it looked as if you had to move your body ack and forth in order for it to move. 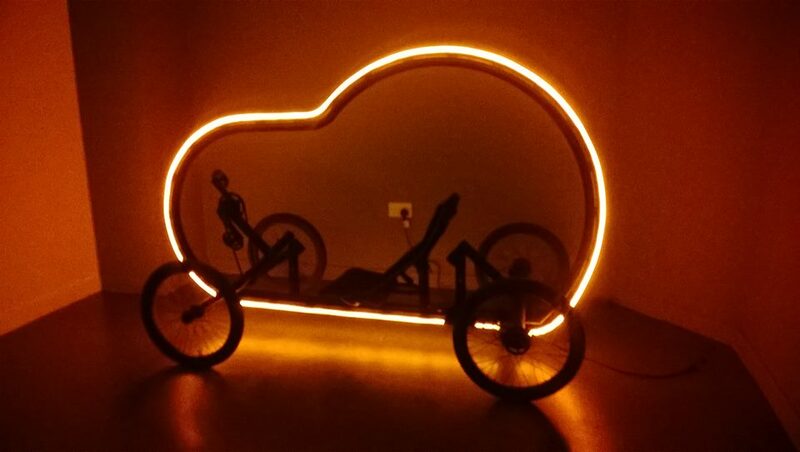 There was also a bike in a dark room, almost like a go kart but what made it unique was that it had a glowing neon orange frame around it. There was no explanation as to what this bike was which I thought was very interesting leaving it as a mystery. There were headphones playing music that cyclists listened to too get them into rhythm with the other cyclists, but it really didn’t sound like music at all, instead it was just weird sounds. I generally thought that the Bike Show was fairly good. I am not really interested in cycling but looking at the different abstract bikes was interesting. I would highly recommend it if you’re a big cycling fan, but it’s worth a look anyway, just to look at some of the bikes that people have actually designed and made. Before visiting Bike Show, I had my doubts about how interesting the show would be as I am not a big fan of sport. However, I couldn’t have been more wrong as the gallery was full, combining many elements, such as art, music and modern day technology. I really love how the place is set out. It was inspiring as it has given me visual ideas of what my fashion show is going to be like, if or when I become a fashion designer. As I was looking around the room, I imagined myself being a model walking round the exhibit fiercely (it has to be done!). I began to get more and more into the show, looking at how the pieces have been put together, how well they were made and the details of each individual bike. It was amazing! So many cool bikes that I never thought would be possible. I would strongly recommend this exhibit to everyone because you never know what you are going to find. Even if you don’t like cycling, give it a chance because it might make a new discovery or an inspiration that leads you to many different things that you never thought of doing in the future. Bike Show is designed to appeal to cycling devotees – for amateur cyclists, this is the best place to be. The bikes were made out of recycled bicycles, and issues of contemporary ownership were explore in the disaplys. I like that all the bicycles were different, all having their own unique twist of some kind. Some of the designers’ names are Biomega and Philippe Starck. Some of the bicycles are very oddly shaped and look quit odd to be honest, but it’s the same with cars. They have to be a certain shape so the air flow can pass over and around the object. This is called ‘aerodynamics’. We want the wall of air we are hitting to pass over us and not stop us.This is why you see cyclists get low down on their bikes, making a more streamlined shape. This makes it easier to cut through the air. 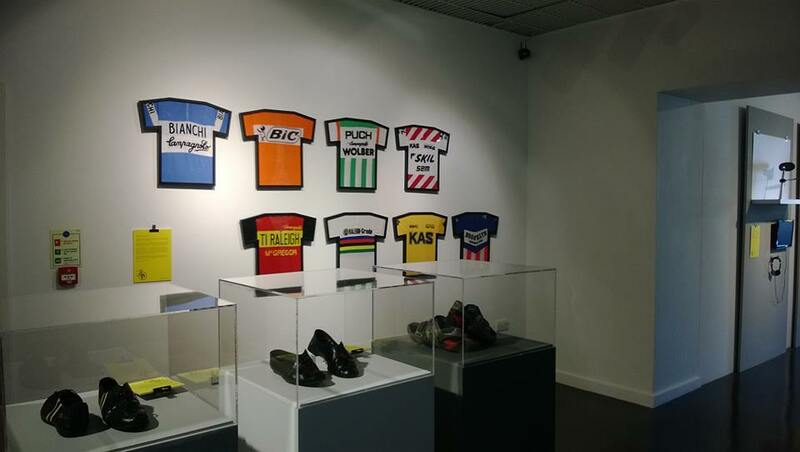 The exhibition examines the spectacle of the Tour De France, its history, its language and several Yorkshire riders who have ridden it. I’m not exactly a bike person, so I don’t really have a lot to say about them, but if you’re a person who’s into bicycles and want to learn a bit more about the way and why they are built, or you just like bike racing, then this would be a good gallery to go to. This exhibition will give anyone who love bicycles a thrill, while exploring the different bicycles that have been out on display. This exhibition takes a look at both the very first racing bikes and the different designs of uniform. 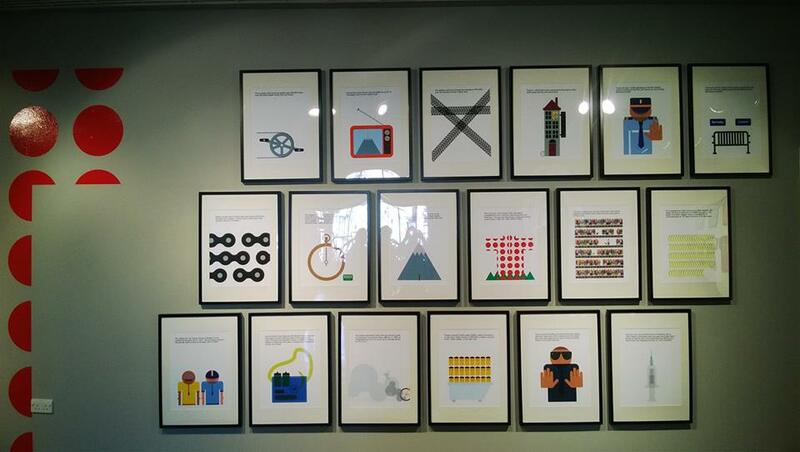 It also looks at the people that took part in the Tour de France. I’ll admit that I’m not the biggest sports fan and that I don’t know much about this sport, but I found that after going to this exhibition I had learned quite a lot. We were treated to displays of the different models of bikes from very first to the latest (this really grabbed my attention). I was also treated to some footage of a bike race and to some of the many styles of uniforms. I believe that it is for the 20+ because of the amount of information on display. In order to improve there should be more activities for the children, helping them to get them interested in sport.